FILE - Prosecutor Fatou Bensouda (C) and Deputy Prosecutor James Stewart (R) attend the first audience with the chief of Central African Republic's soccer federation Patrice-Edouard Ngaissona at the International Criminal Court (ICC) in The Hague, the Netherlands, Jan. 25, 2019. 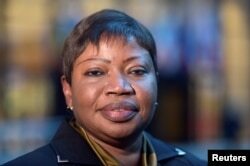 FILE - Fatou Bensouda, Prosecutor of the International Criminal Court (ICC), poses for pictures at the European Council in Brussels, Belgium, Jan. 26, 2017. "We're talking about a situation in which there's been impunity for abuses committed to all parties in the conflict — it would be about much more than U.S. conduct," she said. "It would also allow the prosecutor to look at abuses committed by the Taliban and Afghan national forces." "Had the prosecutor said, 'Look, I'm closing the preliminary examination and not pursuing any investigation of these crimes in Afghanistan' — how would that make the court look right now?" Kersten said. "That would be very bad for the court and its legitimacy."